Do you need to extract text from images, videos or PDF? 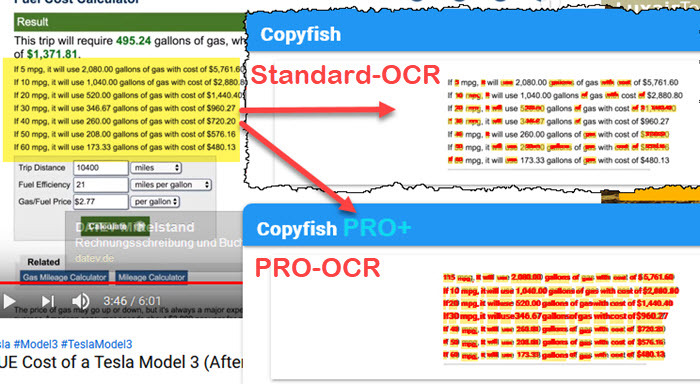 If yes, then the Copyfish 🐟 free OCR software is for you. Common reasons to extract text from images are to google it, store it, email it or translate it. Until now, your only option was to retype the text. Copyfish 🐟 is soooo much faster and more fun. “Images” come in many forms: photographs, charts, diagrams, screenshots, PDF documents, comics, error messages, memes, Flash – and Youtube movies. 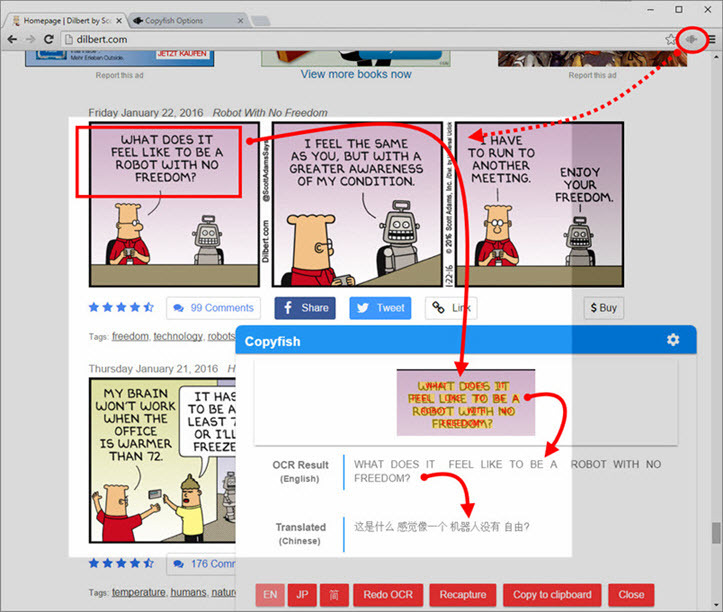 Both versions are identical, except for the desktop capture OCR feature, which is not yet supported by the Firefox browser. Copyfish has a Getting started page. If you have questions, please use the contact form. We love to hear from you. And even so this is a free Chrome extension, we read all emails and typically respond within 1-2 days. 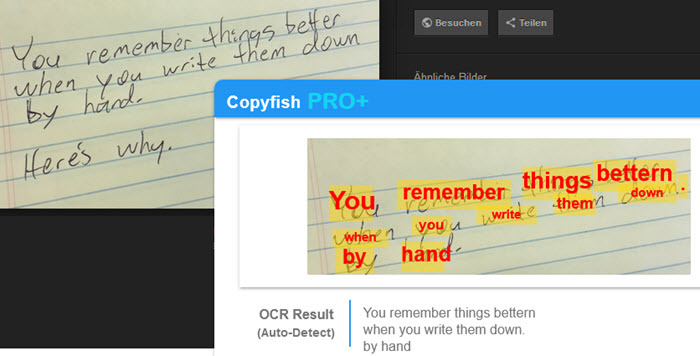 Often requested, and now available: In addition to the well-known free OCR.space OCR option, Copyfish offers now the option to use an even better PRO OCR service for OCR. For translation, we integrated Google Translate, the best translation service available. The PRO and PRO+ plans are available as monthly subscription. All paid plans include a free 7-day trial. If you cancel within the first seven days your payment is automatically refunded. You have a 100% money-back guarantee. If you have any question on what is the right plan for you, please contact us. We offer discounts for students, universities and non-profit organizations, just ask us. What is the difference between Standard and PRO OCR? The PRO OCR plans use 100-times more processing power. This means that the conversion is faster and the results are significantly more accurate than with our free standard OCR plan. The PRO OCR hardly gets any character wrong, and it can even read handwriting. Below you find a short comparison of the standard and PRO OCR results with three examples. But you don't have to take our word for it. You can test PRO seven days for free. OCR of a handwritten note. Standard OCR can not read handwriting at all. 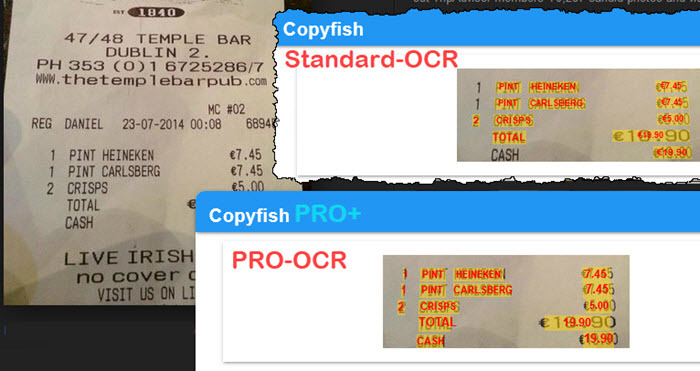 PRO OCR also auto-detects the OCR language(s) and works well with mixed language documents. Still unsure if PRO OCR works for you? => Subscribe now, the first 7 days are free (Cancel anytime). The more people use Copyfish, the better it becomes over time. Please help making Copyfish better by sharing it on Facebook, Twitter,... - or by giving it a good rating on the Copyfish extension pages in the Chrome and Firefox addon galleries.